Former U.S. Secretary of State Madeleine Albright addresses a packed Hannaford Hall on the University of Southern Maine’s Portland campus on Saturday afternoon. PORTLAND, Maine — Madeleine Albright told Portland audience members Saturday afternoon they must be willing to listen to political opinions that challenge theirs. Albright, a prominent Democrat who was the first woman to become U.S. secretary of state in 1997, said her mentor, the late former U.S. Sen. Edmund Muskie of Maine, was willing to buck his own party in the name of what was best for America. The talk was held as part of a series of activities celebrating the 100th anniversary of the birth of Muskie, an influential lawmaker behind the federal Clean Air and Clean Water acts in the early 1970s and man for whom USM’s public policy school is named. Muskie also spent four years as Maine’s governor in the late 1950s and served nine months as U.S. secretary of state under President Jimmy Carter from 1980 to 1981. He was the 1968 Democratic vice presidential nominee and was also a candidate for the Democratic presidential nomination in 1972. Both Albright and Shields lamented the explosion of large donations in political campaigns in recent years, spurred in part by the U.S. Supreme Court’s 2010 ruling that donors’ use of money is constitutionally protected as free expression and could not be limited. “If you’re running for president, you’re going to spend time with people with money — big money,” Shields said. “These aren’t people who go to public schools or depend on public transportation or public recreation or public places. 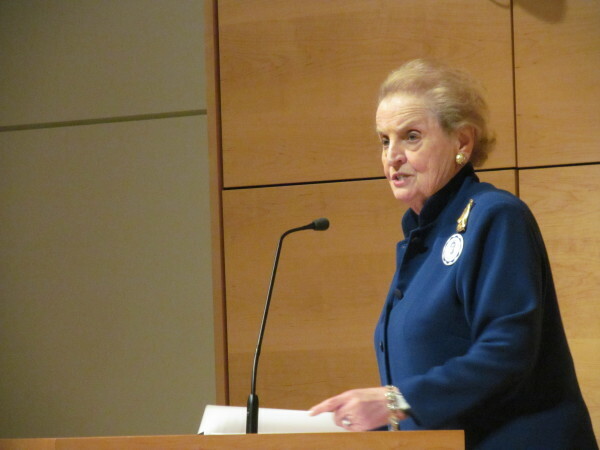 Albright said Americans can begin to reverse the tide of hyperpartisanship plaguing politics today by keeping open minds and listening to people whose opinions differ from their own. She said she listens to conservative talk show host Rush Limbaugh on the radio regularly. Albright said conservatives should be open to the idea that government programs are sometimes needed and positive, and liberals should be open to the idea that the government can be too big and wasteful. “The men and women who founded our country loved freedom, but their goal was not to eliminate government. For all of its shortcomings, our government should be a source of pride for our citizens,” she said. The former secretary of state said, “One of the qualities Senator Muskie had was he listened. Albright’s talk in Portland came less than two weeks after Election Day, when Republicans claimed sweeping victories both nationally and locally, taking control of both the Maine and U.S. Senates, and increasing their numbers in the GOP-held U.S. House and Democrat-led state House. Incumbent Republican Maine Gov. Paul LePage, who many political analysts considered vulnerable, also decisively turned away a challenge from popular six-term U.S. Rep. Mike Michaud, D-Maine. Shields and Albright said Democrats and Republicans alike must be open to re-evaluating their positions and finding common ground.